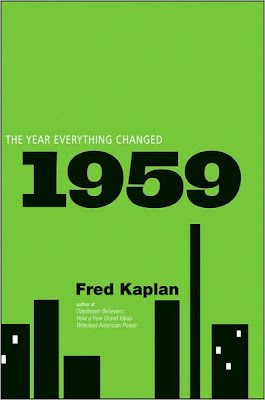 What's special about 1959? According to author Fred Kaplan, it's when we shrugged off tradition and got our modern funk on: Miles Davis released Kind of Blue, Burroughs published Naked Lunch, the Guggenheim opened, and Searle petitioned the FDA for approval of the first birth control pill, among other things (history lesson courtesy of Publishers Weekly). Olinsky's minimal design respects the wealth of these achievements without resorting to the "photo quilt;" heck, I could have even done without the buildings. Type geeks, chime in: what's the title typeface, and is it appropriate to the late '50s? The font on the cover is Giza Seven Nine and was designed in 1994. It's an egyptienne based on a specimen from the Victorian Era (1845) by Vincent Figgins. Rudolph: wow, that was quick. And thorough! Thanks for the information. It has a definite mid-century advertising vibe to it. And I actually like the buildings. I really like the restraint of this design. But what is the rationale for the buildings? Many skyscrapers built that year, lots of people moved to town, it was the year buildings became rectangular, decoration, city feel? Anon 3:15: Good question. I don't know the answer. Here's Kaplan talking about the book; many of the things he mentions are "city" things. But certainly not all.